Cole Wamego (#11) with a 15 yard gain down to the 15 in the opening drive against Tahlequah. QB Talon Coulter (#1) gives the play to the other 7th graders in the opening drive. Grayson Boomer (#82) scored the first touchdown on a 2-yard 4th and goal pass from Talon Coulter at 3:21 in the first quarter. Ethan Keller (#14) recovered the Cardinal kickoff after their first score at the 22 yard line. Cole Wamego (#11) scored the second Cardinal 7th grade touchdown on this 26 yard run with 2:53 left in the 2nd quarter. The PAT kick was just short and the score was 14-0. A few of the JrHi cheerleaders were still playing volleyball during the 7th grade halftime ... and arrived after this photo. Checking out a video of their halftime performance? Malcom Tillman (#26) returned this Tahlequah punt to the Tahlequah 34 yard line in the 3rd quarter. First step of the offensive line charge. QB Hayden Mitten (#5 far left) scored on a 3 yard keeper with 47.4 seconds left in the 3rd quarter. This Nick Goldsmith extra point kick was the only one of 3 attempts that didn't make it through the uprights (after the 2nd Collinsville TD). 7th and 8th grade extra point kicks are worth 2 points to encourage development of that skill for later grades..
Cooper Gorrell (74) and two other Cardinals combined for this tackle for a loss in the first quarter. Andrew Pickell (#4) and Trent Brown (#43) make this tackle early in the 3rd quarter. Hayden Knight (#68) rushed this 4th quarter Tahlequah pass attempt. The Collinsville Cardinal Jr. High football teams hosted the Tahlequah Tigers this past Thursday night at Sallee Field in a Metro Lakes Conference contest. After all three contests were complete the Cardinals gave the Eye of the Tiger, a black eye, as the Cardinals swept the series in all three games. In the 7th grade contest the Cardinals dominated every phase of the game. The kicking game was outstanding providing turnovers which led to points on the board. The defense swarmed the Tiger backs and the offense was overpowering all night long. Cardinals win 22-6, and improve their record to 2-2. We are showing improvement. There was a Tiger player taken by ambulance to a local hospital for observation after the game. He was released Friday morning. We wish him a quick recovery. The Cardinal 8th grade team proved without a doubt that we can, and will be, a good football team. The offensive line plowed huge holes for the running backs to run through and the Cardinal defense refused to allow the Tigers to cross our goal line. The kicking game was outstanding. Cardinals win BIG 31-0. No injuries were reported. We are getting better! The money game of the night (9th) proved to be a slugfest. Both teams played great defense. Both teams had sound kicking games. Both teams proved they could move the ball. But the Cardinals were just too dominating up front in the running game. Cardinals win a close one 7-0. No injuries were reported. The Cardinals improve their record to 4-0. Blake Burd continues to be sidelined with a concussion. We miss Blake and wish him a healthy recovery. 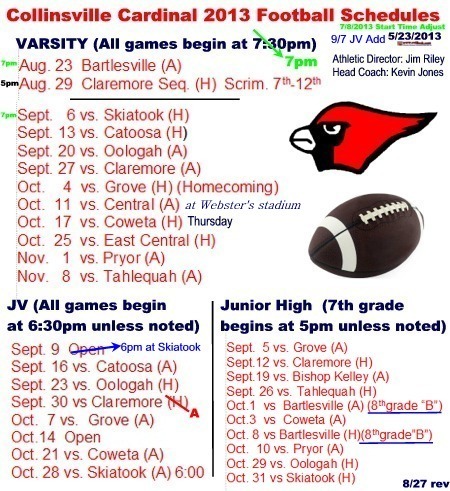 Our next action will next Thursday at Coweta beginning at 5pm. This is an important conference battle for all of our teams. In the past the Tigers have been a tough opponent. We need everyone to get loud and cheer our teams on. Hope to see you there. Its great to be a Cardinal!